This banquette is made of a poplar frame and plywood panels. It has a toe-kick heater under the left half and two drawers, one 3 foot and one 4 foot long. Yes, those are very long drawers that make for lots of storage! The paint is Pittsburgh Manor Hall oil base. It flows out and self levels beautifully. I sprayed on the first couple of light coats in the shop then did the installation. After the install was complete, I caulked it all in and brushed on the final coat. Spraying leaves an automotive like paint job that is really smooth. 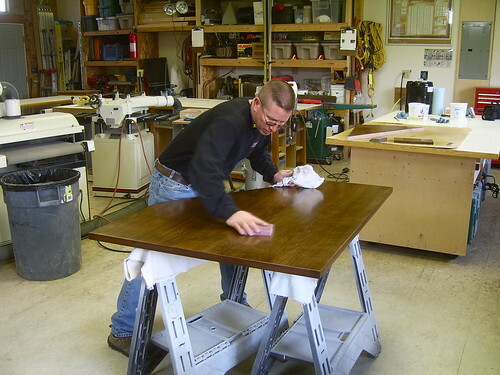 Brushing the final coat allows the homeowner to make touch-ups with a brush and they will not be obvious. 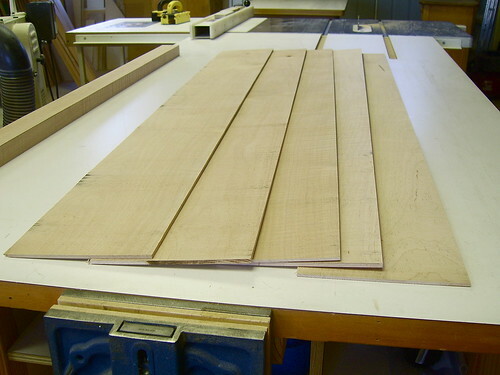 The table top is made of curly maple and the angle is cut to accommodate the traffic pattern. A local upholstery shop made the cushions. The finish that I used is ML Campbell’s Krystal which is a conversion varnish. That means I have to figure out how much I need to use and activate it by mixing in the catalyst. This also means that I need to plan on using it all within about 12 hours once it is activated. It is easy to handle and looks pro when applied. It is rated for use on table tops and cabinetry for the kitchen and bathroom. That means it is very durable. The stain is Sherwin Williams BAC wiping stain in black walnut. The BAC wiping stains flash off fast. They are rated to dry and be top coated in about 30 minutes. This is dramatically faster than Minwax, Behr, or most other stains which have a dry time of 24 hours. I highly recommend looking into the wiping stains from Sherwin or ML Campbell. They also have a line that dries in 2 hours. If your woodworking on nights and weekends I recommend these products. Looks great, Todd! I had never heard of those products before… they dry so quickly! I was wondering when you’d post another project. I’ll have to look into those stains. Being inherently impatient they sound like something I’d really use. Those have got to be some heavy-duty drawer slides! They are made by Accuride and they are verrrry expensive. They can be side mounted or laid flat and under mounted. If mounted on the side, the load rating is 500 bls. Mounted flat underneath the load rating drops to 150lbs. Greg – Yes it has been awhile. Doing simple home repairs does not seem very glamorous and worthy of posting. But I am starting to consider how much I take my knowledge and skill for home repairs for granted. I get called because others can’t do it. Maybe I should post more how-to here and in HomeRefurbers. A lot of people want to know how to do these kind of tasks. Todd: ‘ve been following the pictures that you post on flickr. It’s nice to see it all come together. The maple top is great. What are you going to make with your resawn pieces? A nicely built,planned, and finished project. great Job. Your shop looks well organized and laid out. Do you have a spray booth to shoot your conversion varnish? I was wondering the same thing as Jim. I know in your shop pics you said you had a finishing room that was being used for storage. I was wondering if you are finally using it or still doing finishing work in your shop ? I your third picture, is that a a/c vent on the bottom ? The toe kick heater is a 220v electric unit. There was a 4’ strip heater under the window and that end of the kitchen gets cold because of the old windows and the back entry door that is off to the right. I am just spraying in my shop until we can finish the building. Until then, my finish room is a storage room. If it is cold out I turn the furnace off while spraying, then I open the windows and doors to cross-ventilate the room and get fresh air in. I shut it all up and then turn the furnace back on. If it is warm out, the doors and windows are open any way without fear that the furnace will kick on. Besides that I turn the power switch off for the season anyway. I finish my projects but I am not spraying a lot of finish such as trim packages for a house or spraying everyday, so this has worked so far. With the fast dry times of lacquer or conversion varnish I do not have contamination issues. The re-sawn material will tentatively be used in a project coming up soon for the same clients. I just hated to plane that lumber down and waste all of that great curly maple. I was able to chase the line freehand and I had great results. I love my Grizzly bandsaw. 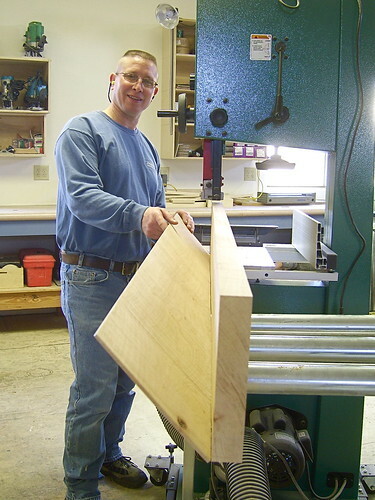 WOW….now that is some nice re-sawing. I thought my old Rockwell did a good job…makes mine look like a butchers saw. I only have been using the cheap blades from Grizzly for my re-saw projects. I am planning on getting a high-end re-saw blade in the future so it will only get better. The Grizzly blades work but they do not stay sharp for a terribly long time. As long as they are sharp they track consistently and do a nice job. What size bandsaw is that ? 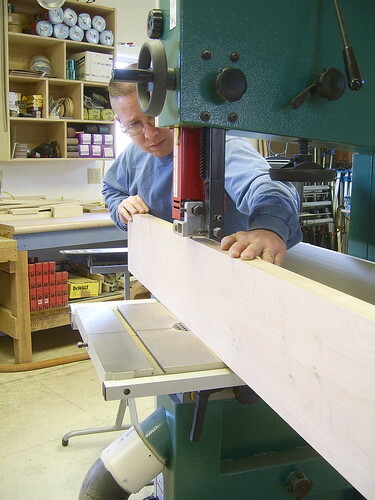 It is a 17” bandsaw with 12” resaw capacity. I bought the resaw fence at the same time but I have never used it. I have been able to freehand everything to date. It cuts that good out of the crate. Great looking project Todd. 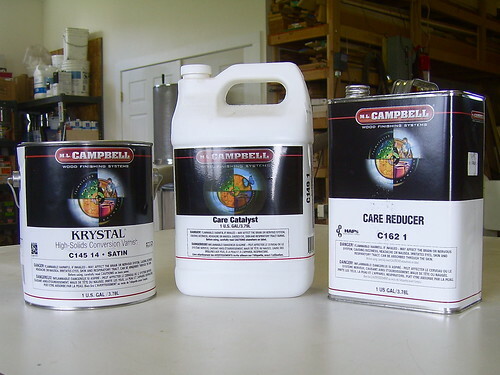 We use a lot of ML Campbell products in our shop. Great product. I sure wish I had not sold my Grizzly Bandsaw. I had the 14” model. Very nice unit Todd. You did a beautiful job on this piece. I plan to put a unit like this in my new kitchen. Thanks for the inspiration.